Wasn't sure about this ball at first. It is weaker than some of my other stuff. Then I started using it when the lanes opened up and wow. That is where the ball thrived. It is now my go to ball when they open up. Doesn't over react in the dry but still finishes when I get it in the wet. Great ball for over/under shots too. This ball... i have no words for! Actions speak louder!! 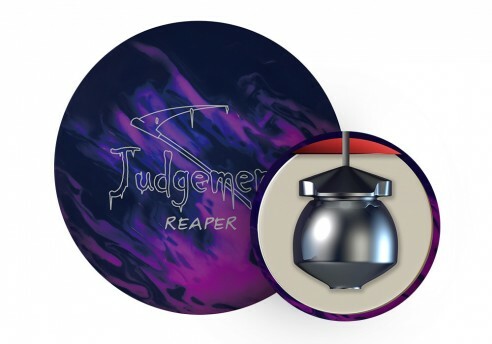 Have it drilled with a stacked layout, and the ball literally swings like the scythe of the grim reaper!! Which in turn, lays the pins to rest! I absolutely love this ball when the lane start to open up. Mine is drilled 70 x 3 3/8 x 20. With a bit of surface, I can actually use it on fresh oil to keep my angles nice and tight. With a shine, and on the transition I can move left and throw right. The ball retains excellent rotational energy and hits the pocket hard. A must have in your bag! This ball serves as a great benchmark ball. It's smooth through the heads and mids and has continuous backend through the pins. I was able to use this ball almost every night for every game because it's easy to read even when the lanes transition. Must have if you're looking for a great benchmark ball. This ball provides the back end pop that you're looking for when the carry down sets in. It gets through the heads clean and makes the turn down lane without an issue. This one is a keeper!